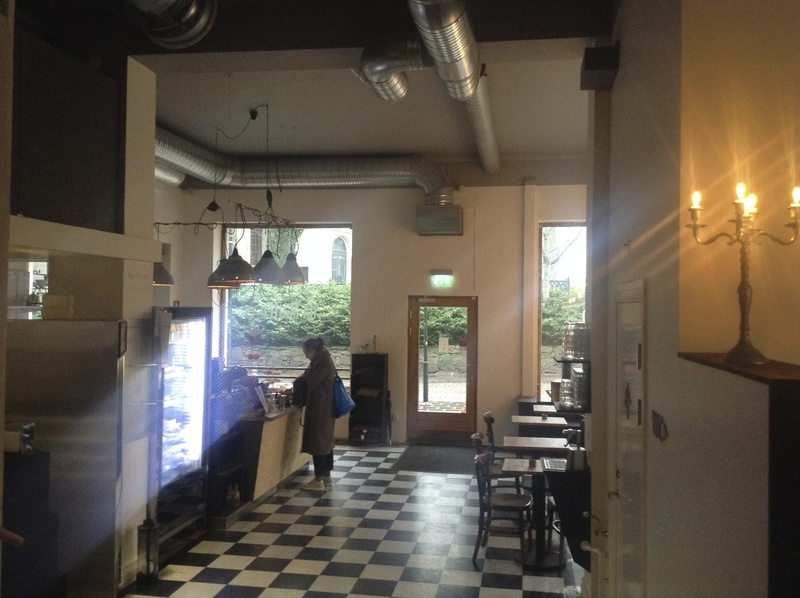 borås – not ready for good coffee? A month ago, the annual “restaurant week” was celebrated in Borås, and one day, the daily poll on the website of Borås Tidning asked the question, “Is Borås a restaurant city?” These are ambitious concepts: “restaurant week” and “restaurant city.” Many readers seemed to think that Borås wasn’t really a restaurant city at all, and today’s entry on my blog gives an example of why this may be so. I should begin by saying that some culinary change for the better has definitely happened in these parts. If you search the archives of my blog you’ll see that this development is, to put it mildly, massively overdue. But let’s just make a quick tour: a few years ago, for instance, a fine Indian restaurant, Masala Kitchen, established itself on Yxhammarsgatan. It is part of a small chain (the three other branches are in Gothenburg), but their food has the stamp of an individual kitchen nevertheless and is quite enjoyable in its diversity; the service is friendly and personal and the restaurant is clean and pleasant. Directly opposite Masala Kitchen, a small Italian trattoria with the optimistic name Viva La Focaccia has opened, and to judge by their number of lunch guests, they are doing rather well. Unsurprisingly for an Italian trattoria (but a small sensation for Borås), their pasta sauces have straightforward no-nonsense Italianate taste profiles, the pasta itself is hot and firm and the coffee agrees pretty well with what you would get in similar places in Italy. The new cheese and salumi shop that has moved into the premises of what used to be an utterly useless sweets store is also exciting: Cassise at Österlånggatan 40. Cassise is impressively well-stocked with a large variety of international specialty cheeses and with a wide range of meat products. Who would ever have thought that the 66,000 inhabitants of this city would get access to good-quality Italian pancetta or lardo? We were even happier — and this is what I wanted to write about — when da Matteo, a well-established high-end coffee importer, roaster and seller from Gothenburg, opened a nice, roomy new café/restaurant in Borås. On a good day, with one of the better (among their overall excellent) baristas at the controls, da Matteo’s coffee can be the best coffee you’re likely ever to drink (and I’m saying: anywhere). So, all of a sudden, Borås has easy access to some of the best coffee in the world, in a place that also fulfills all possible requirements for a nice café-workspace: free wifi, a variety of tables, no excessive noise or obnoxiously loud music, and a central location (what I’m going for is outlined in this post, in case you’re wondering). The interior of da Matteo Borås is perhaps a little rough around the edges, but what needs to be clean is clean — the restrooms, for example (compare that with Gothenburg’s first-ever-Matteo in Viktoriapassagen, and you’ll appreciate the difference). And if we weren’t trying to cut down on the carbs, I might start raving about their bakery products. The service is nice and friendly. Our new routine has been to go there on Friday afternoons and do our work there. It has been a fabulous way to beat January and February, which otherwise can only be survived in these parts by not getting out of bed. Does Borås deserve such luxury? Obviously not. The terrible news is, da Matteo in Borås will close on 17 April 2014. Why? Every day, our newspaper features a personal portrait of some local person of interest. I once got a page for myself after I found a piano at the recycling station. Most of the time we will read about someone who paints, loves music and/or is active in the church. Here I am asking the universe for an improvement. Worldwide. Imagine that you are in a medium large city, carrying around a backpack with a book or two, your calendar and your laptop, you’ve got an hour to spare and it is, say, 11:15. Time for a seat, a cup of coffee, a horizontal surface and an illusion of a tiny private space. Unless you’re at some American university campus and have access to some dedicated sit-and-wait-and-sip place, your chances of finding a suitable café are small. In one typical kind of coffee place one can only manage a quick, standing and back-nudged espresso, like in that corner shop in Ithaca’s Collegetown where there was not even a place to hold the cup. Five years ago I bought a milk frother, since I decided not to have a proper espresso machine with a foam nozzle. It was made, or rather, labelled and distributed, by a well-established Swedish brand, it had gotten good reviews for perfect foam and a good price-device relationship, and it worked well until it, 2 months after the warranty had expired, expired too with a scratch, a fizz and a bleep. So I bought another one and took an effort to handle it extra carefully. It behaved exactly like the first one: perfect foam for a blissful while and then an unannounced exit from this world. I e-mailed the customer service of the firm, mentioned the exact nature of the problem (the motor’s collector gets damaged through normal use and cannot be accessed for repairs) and within days I got a third frother sent home for free. This summer, it quietly joined the others. Now I bought another frother, this time by a German fancy design brand. Let’s see how this one survives. It foams better, the motor makes less noise and it stands all by itself on the counter. Why do I persist in wanting milk frothers? Because they are great. For someone who had his early milk-frothing training using a cheap and coarse wire brush in a battered aluminium pan, they are the symbol of coffee culture luxury. Stove-top coffee makers are an attractive alternative to a space-eating grime-collecting espresso machine. Interestingly, there are many general instructions of how to use it available, but few really concise descriptions of what to do and avoid when using stove-top espresso cookers. borås - not ready for good coffee?